Victor Kariuki, a person living positively with HIV at the World Aids Day celebrations yesterday. Being diagnosed with HIV is harrowing. People feel scared, sad, hopeless, at times angry. Most go through depression over the inevitability of early death and thoughts of life unfulfilled. Victor Kariuki’s story is different. 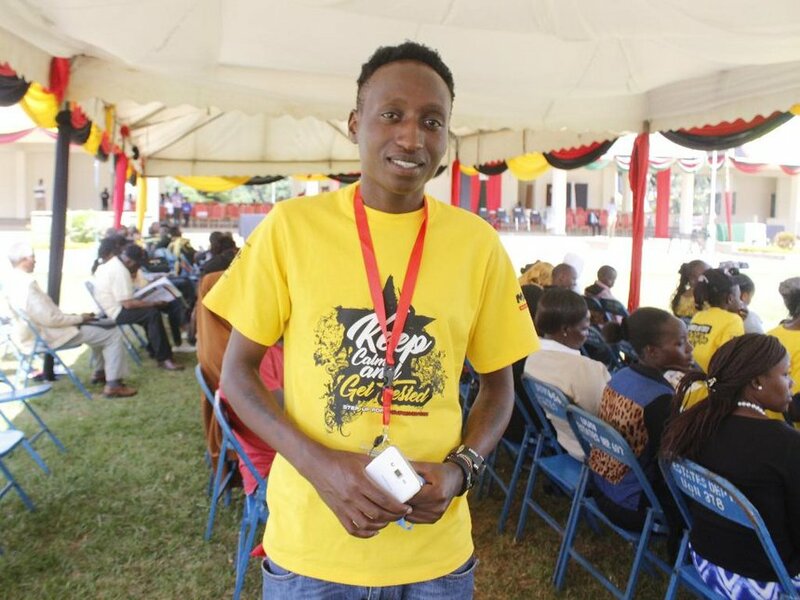 Victor, 25, was as among those observing World Aids Day at the University of Nairobi Grounds on Friday. Born in 1993, Victor lost his mother to HIV-related illness, when he was seven-years old. Two years later, he started getting seriously ill. A visit to the doctor confirmed he was HIV positive. The doctor explained to him his condition through a chart. According to Victor, one chart showed the body of a skinny unhealthy man and the other showed one who was well-fed. The doctor told him that he was “the skinny man”. It was the doctors way of telling him he was HIV- positive. Even after learning about his status, Victor was hesitant in taking drugs, as he had no one to guide him and tell him about the changes he would start to experience. His life in the estate and at school was not enviable. Victor said he felt dejected, unwanted and unloved. He faced a lot of stigma as his peers isolated him. “I had no one to play with. I was just a kid wanting to live a normal life. But here I was living with a disease that had taken away my happiness,” he said. Victor likened his experience to that of a never-ending dark void that consumed everything, leaving him feeling empty. The emptiness he said was so intense that it was hard to pretend everything was okay. He was only 14 years old, when he tried to take his life for the first time by swallowing 30 tablets of ARV drugs. When that didn’t work, he later intentionally ran in front of an oncoming vehicle on Juja Road. He said he had made his calculations and there was no way the truck could miss him. It did. “I just wanted to die. I couldn’t bear anymore,” Victor said. He said after his second suicide attempt, an old man who witnessed the incident beat him up. With his plans having failed, Victor decided to run away from home. All this time he was not taking drugs. After consuming the only Sh500 he had, he left home. He was then 15 years old. Victor became a street kid and lived in the streets for two years. He later joined a gang that offered him security, food and shelter. In exchange, they required him to carry stolen car parts. The street life was not easy, but it gave him a sense of belonging. The gang later evolved and began to carry out major crimes, such as hijacking. After hijacking, Victor’s duty was to carry a gun in a sack concealed with waste plastic bottles. When he was 16 years old, all his gang members were killed. “This was now my turning point. I had to change my life or I would be the next one to face the bullet. I decided to visit St Theresa’s Church for prayers and one day my grandmother miraculously located me. I can’t explain how it happened. It’s just God,” he said. Victor hadn’t taken his ARV drugs for two years he was in the streets. He contracted brain menengitis and tuberculosis. He said it is the Grace of God that kept him alive. He was admitted at the Kenyatta National Hospital for a whole year. When he left hospital, he resolved to go back to school. He sat his KCPE exam when he was 18 years old and scored 249 marks. Victor joined SSD Secondary School on Ronald Ngala Street. He finished high school through the help of well-wishers. He is currently pursuing his degree in communication at Presbyterian University. He finally accepted his status and began to take without fail his drugs, which he refers to as his “pets” without fail. Victor has several tattoos on his hands and cuts on his upper left hand. One of that tattoos inked in Japanese characters is his mother’s name, Margaret. He says he was bitter with her because she left him, but he still loves her. His right hand has four footprint markings, which symbolise his passion for media in film and photography. The other drawing on his left hand is a Bible verse from Philippians 4:13, which says “I can do all this through Him who strengthens me.” Another tattoo is a heart surrounded by thorns depicting his love for his mother. The cuts on his left hand are self-inflicted, his way to deal with pain. His advise to those living with HIV is that people should not let HIV define them. “I hope my experience will speak to the many who are in denial,” he says. Victor, also a community helper, aspires to be a better father and a good husband. He looks forward to having a ‘full team’ of kids. I’m pinging because I want to comment on the already decent work on the tattoo content on todayinkenya.com. Things are getting a bit outdated… and Google just updated their algorithm yet again, you know how that’ll impact your greatest free traffic source, if there isn’t a consistent flow of fresh content! You see, websites get majority of their free traffic from their blog, and I feel that you could use a little help, since you are not blogging daily yet. You are receiving this message because the contact form at todayinkenya.com is open to the public. Thank you.